How to change Emotional Eating? It’s been a bad day at work. The kids have been acting up all day. You’re stressed. How do you deal with it? Maybe by gobbling an extra piece of fried chicken? Or reaching into the bag of chips while zoning out in front of the television? Perhaps by snuggling up with a container of ice cream and spoon in bed? 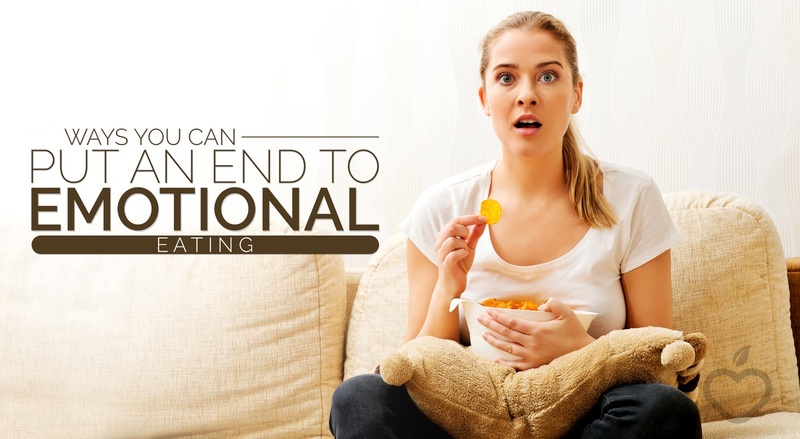 We’ve all caught ourselves giving in to emotional eating. And yet we also know that we can’t lose weight without limiting the calories that pass our lips. So how do you move beyond the urge to use food to fix feelings of anxiety, anger, or frustration? And how do you keep your kids from falling into the same trap? Emotional eating tends to be a habit, and like any habit can be broken. It may be hard, especially if you’ve been doing it for a long time, but it is possible. Weight problems often run in families, so the easiest way to tackle emotional eating is together as a family. You can’t expect an overweight child to stop binge-eating snacks and junk food when other people in the household are eating them. Here are four tips to help you and your family stop using food as an emotional fix. 1. Make your house healthy. Start with the obvious: If there is no junk food in the house, you can’t binge on it. Instead, keep unprocessed, low-calorie, low-fat foods such as fresh fruits and vegetables, hummus, and unbuttered popcorn around for munching. And remember that they’re not just for your kids. Set a good example for them by trying and enjoying healthier options. Take a look at your refrigerator and pantry and cut down on your go-to temptations. Before you go grocery shopping, take a breather, go for a walk, and wait until your emotions are in check. 2. Figure out what’s triggering emotional eating. The next time you reach for comfort food, ask yourself, “Why do I want this candy bar? Am I really hungry?” If not, try to figure out what emotions you are feeling. Are you stressed, angry, bored, scared, sad, lonely? A food diary — a written record of what, how much, and when you eat — may help you see patterns in how mood affects what you choose to eat. Check in with how your kids are feeling, too. If you’re aware of the social and emotional issues they are facing, it will help you guide them to make better choices when dealing with their emotions without eating. Find out what’s going on in their personal lives. Ask about school, friends, and how they feel. Do they feel good or bad about the way life is going? When times get tough, it helps to have some go-to healthy ways to handle stress. You and your kids can try deep breathing, going for a walk, or listening to music. Sometimes, an outside perspective can give you an “aha!” moment that lights the path for change. If you’re having trouble controlling your emotional eating, don’t be afraid to seek the help of a mental health professional. Although professional counseling or psychotherapy might not be comfortable for elementary school children, it can help you or older kids figure out what’s behind emotional eating and offer help for eating disorders. Once you figure out why food makes you feel better, you can come up with alternative behaviors that can help you cope instead of emotional eating. Frustrated because you feel like you’re not in control? Go for a walk on a path you choose. Hurt by a co-worker’s mean comments? Take it out on a punching bag, or make a plan for how you’re going to talk it out. Bored? Distract yourself by calling a friend or surfing the Internet. If you deny yourself all treats, that can lead to cravings and binge eating. Instead, allow yourself to have your favorite foods occasionally and in smaller portions. Limit the amount of chips or candy by putting a few in a small bowl instead of mindlessly eating them out of the bag. Keep the focus on fun and feeling good so that new, healthier habits are easier to adopt. A study in a British health journal showed that teenagers were more likely to take a walk when they heard that it would make them feel good than when they heard it was the healthy thing to do. Focus on the positive changes you are making, one step at a time. You’ll get better results with encouragement than with harsh criticism. For example, praise your child when he takes only one cookie out of the box instead of a handful. Changing an emotional eating habit is a process. Some backsliding will happen, so acknowledge when it does and use it as a chance to plan how you’ll deal with the same situation in the future. Successes are sweeter when you can share them. Celebrate a week of healthy eating as a family by taking a walk in the woods, having a swim night, or going skating together. When you work together to build better eating habits, the support you can offer each other and the rewards you enjoy can be priceless.